Both the acoustic and non acoustic Green Barriers™ require minimal maintenance. The Green Barrier™ in living willow is normally supplied with a trickle irrigation system that runs throughout the summer months for at least the first two years. As a living structure it requires the same attention and general level of care as a hedge. 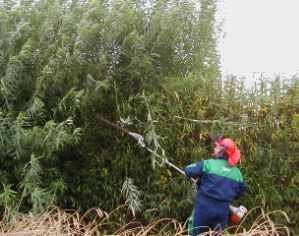 It is recommended that the willow is cut back once a year in the winter and that it is given a light application of fertiliser in the spring. Regular watering or trickle irrigation until established - normally 2 years. Reduced water requirement in the second season. Summer trimming in the first year; and normally annual trimming thereafter - by hand held machine or tractor flail. Minimum trimming interval is every 2nd. year, but can be according to desired finish and location. Visual plant health inspection in first two years, with an annual winter application of fertiliser as required according level of quality and impact required. The Green Barrier™ in woven willow requires very little maintenance. 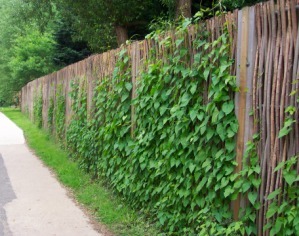 Any evergreens or climbers planted along the length of the barrier will require tending until they become established. No watering required for the Green Barrier in woven willow. Application of fertiliser as required. Tidy up new climber growth. Depending on site sensitivity there is the possibility of landscape plant maintenance. Click here to see our full range of cell grown plants and planting accessories. Annual inspection for wear, tear and any vandalism.